In the last post we talked about the five new features that have been added to Google Classroom enhancing thus the overall functionalities of Classroom and making it a collaborative learning hub. In today’s post, we are sharing with you this handy resource from Google for Education to help teachers especially those new to Google Classroom make the best of this platform in their instruction. The page features a number of video tutorials covering a wide variety of Classroom tips and tricks. 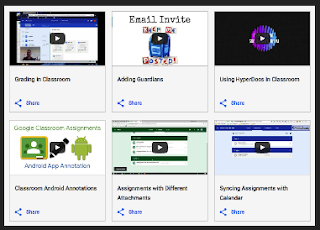 Some of the things you get to learn from these videos include: how to create a new class in Classroom, how to create an assignment in Classroom, how to add students to classes, an overview of Stream page, how to use the grading system in Classroom, how to use HyperDocs in Classroom, how to sync assignments with Calendar, and many more. You may want to check it out and share with us your feedback.